Urbandale’s upcoming condo project 99 Parkdale, which hasn’t been released yet, will include common areas on the top (or 28th) floor. Shown is the south terrace of The Parkdale Club. OTTAWA — Richard Sachs is over the moon about his latest and greatest project, a new condo development called 99 Parkdale. Sachs, president and CEO of Urbandale Construction, asked me to stop by his office to unveil some of his plans. 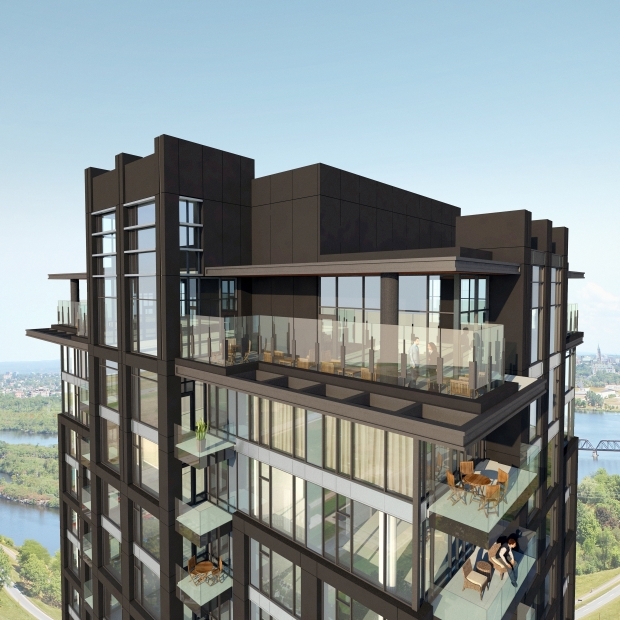 99 Parkdale is the realization of Sachs’ dream to create one of Ottawa’s premier condominium buildings. He is both enthusiastic about the project and proud to be presenting one of the most luxurious buildings since the launch of Cathedral Hill by Windmill Development. Located close to Wellington Village and Westboro shops and restaurants and the Parkdale Market, it will have sweeping views of Parliament Hill to the east and the Ottawa River and Tunney’s Pasture to the west. With renowned Toronto-based interior designer Brian Gluckstein and famed architect Barry Hobin on board, Sachs’ project is sure to succeed. The 28-storey, 180-unit building is likely to be as cutting edge as these well-reputed men themselves. Not only is the building design bold, significant and distinctive, but the highrise will also include most of what buyers look for in a luxury condo. Let’s start with the lobby and work ourselves up to the 28th floor, where The Parkdale Club will be located. Enter 99 Parkdale to find an open and sophisticated lobby that practically screams “Gluckstein design” with its elegant, sleek, yet warm and inviting feel. What impressed me most about Gluckstein’s design — both here and elsewhere in the building — is that he has already chosen each piece of furniture and fabric. Most developers seem to bring in the designer for the lobby and common areas as an afterthought, however, Sachs and Gluckstein are already on the job. The result is that every fabric, lamp, pillow and table chosen appears well thought out. I was impressed. The entrance will be flanked by six, two-storey townhomes, the largest of which will be 1,424 square feet. There are 10 condo floor plans that vary from 750 square feet and expand to just under 2,700 square feet. 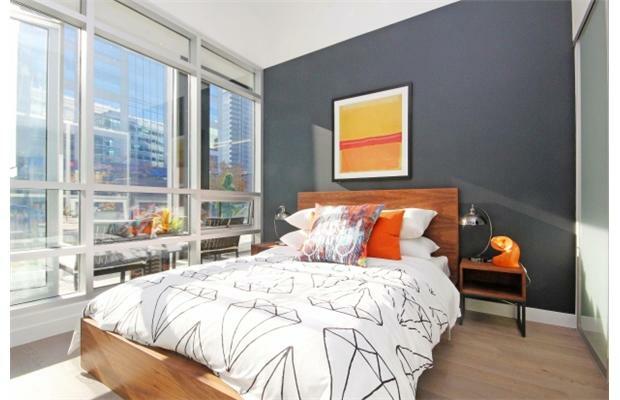 Two 750-square-foot condos can easily be combined to make a 1,500-square-foot space. Sachs asked Hobin to design the space so that there can be 2,700-square-foot units on both high and low floors as he is cognizant of the fact that people buying bigger do not necessarily like to be higher. Whether you choose to reside on a high or low floor will not really impact the views, which everyone will enjoy from most floors. Buyers may also choose eastern or western views, with both vistas displaying fine prospects. On the second floor will be The 99 Club, a fitness area with his-and-hers change rooms, showers, a fitness room and yoga studio. An indoor swim spa (where you swim against the current) and large hot tub, steam room, media room/theatre and games room with a wet bar will also be likely additions. Two guest suites for visiting friends and relatives are other features. The pièce de résistance is the top floor. Normally reserved for the penthouse suite, the top floor at 99 Parkdale will instead be common areas where all residents may enjoy choice amenities and views. It will be home to The Parkdale Club, offering over 5,000 square feet of entertaining space for residents and their guests. Social areas such as, not one, but two separate, private, dining rooms — each with seating for 12 to 14 guests — and two separate catering kitchens will be highlights. Residents wishing to entertain will also have access to an informal lounge with a TV, great for sports nights. And there will be a formal living room for pre-dinner cocktails and a card room with views to the north overlooking the Ottawa River. Last, but not least, those who want to host larger events may use the ballroom with its dance floor and two-storey window. Other common spaces will include a green space on the third floor called The Podium, which will include an exterior landscaped garden court with barbecues and tables for residents, and a dog wash and bike and ski tune room all on a lower floor. There is even a plan to have about 10 bikes available for the residents’ use. Parking spaces will be sold separately for all units. Sachs has not yet determined the launch date or the prices of the condos, but they are expected to start just under $500,000 and rise to about $2,000,000.